The seeds contain the highest silymarin content and can be ground to a powder and sprinkled on cereal or added to a smoothie. The leaves, flowers and roots contain smaller amounts of silymarin and can be eaten as well. Before they open, the flower heads can be partaken of as you would artichokes. Young leaves can be used in salads or as cooked greens. Roots can be boiled as a vegetable. 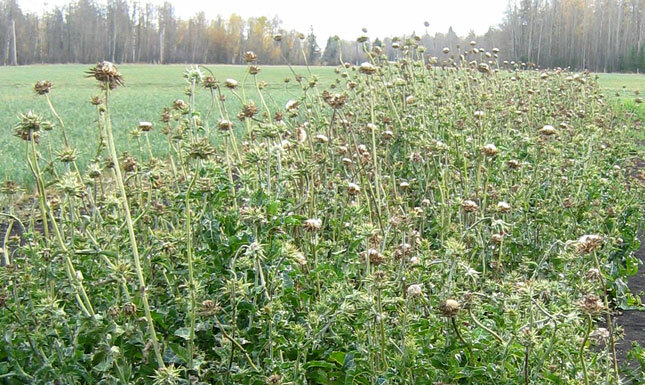 Milk thistle is grown as an annual in Alberta. As the plant self-sows easily, be sure to choose the site wisely and keep plants under control. Sow 1.25cm (1/2 in) deep in early spring. It takes about three weeks for milk thistle to germinate at 10° - 30°C (50° - 85°F). Mature seeds are black in color, while immature seeds vary from cream to light brown, and are attached to a propeller-like pappus that must be removed. Harvesting should take place as the seed heads ripen, before they start to drop mature seed - usually sometime in September. Heavy gloves are recommended for harvesting the thorny seed heads.